Logical Gal – Are you sure? Beyond death and taxes, a lot of people maintain that position. But is it so? 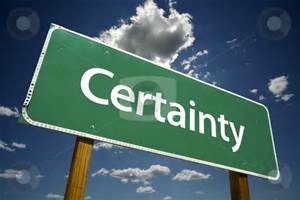 What is certainty and are there different kinds? First a definition – Generally speaking, in every day language, certainty is the quality of being absolutely true. What is ‘certain’ can be a fact that corresponds to reality or an event that definitely has taken place or will take place without a doubt. Intrigued by the concept of certainty, I checked to see if there were other types of certainty. After nosing around different websites, I learned that in a court of criminal law, to come to a conviction the jury must agree ‘beyond a shadow of a doubt’ that the accused is guilty. That is probabilistic certainty – knowledge that is most likely to be true. . In fact, examining cumulative circumstantial evidence to arrive at a high probability of guilt can often solve murder cases that are ‘cold’. Of course, there are less-than-credible claims to certainty. People talk about psychological or ideological certainty – a WANTING to believe something to be so, despite the facts. There is also the danger that in the broad category of ‘mathematical certainty’ modeling future outcomes might have some hidden assumptions that are not necessarily true. 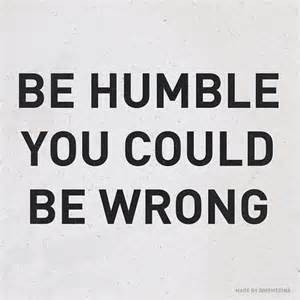 At the end of the day, we should approach the concept of certainty with HUMILITY. I’m not advocating a posture of skepticism, but the acknowledgement that we, as finite human beings, might not be right about everything. I love this article. It’s helpful to understand the distinctions you’re making here. I learned some similar points about the meaning(s) of the idea of “certainty” from a book by Leonard Peikoff, called Objectivism: the Philosophy of Ayn Rand. While I disagree with some of the book’s ideas, I found the section about “the arbitrary” to be clarifying. So how does he(or you) define the arbitrary? That’s a great term worth thinking about. Thanks for your encouragement Cody and I’m enjoying reading your posts, too! The concept of the arbitrary is key to understanding objectivity (by contrast). Here’s a great discussion of the arbitrary from Peikoff (http://aynrandlexicon.com/lexicon/arbitrary.html). “Arbitrary” means a claim put forth in the absence of evidence of any sort, perceptual or conceptual; its basis is neither direct observation nor any kind of theoretical argument. [An arbitrary idea is] a sheer assertion with no attempt to validate it or connect it to reality. Remember that man’s consciousness is not automatic, and not automatically correct. So if man is to be able to claim any proposition as true, or even as possible, he must follow definite epistemological rules, rules designed to guide his mental processes and keep his conclusions in correspondence to reality. In sum, if man is to achieve knowledge, he must adhere to objective validating methods—i.e., he must shun the arbitrary . . . . In a sense, therefore, the arbitrary is even worse than the false. The false at least has a relation (albeit a negative one) to reality; it has reached the field of human cognition, although it represents an error—but in that sense it is closer to reality than the brazenly arbitrary. Cody – thank you SO much for writing all this. I read it carefully and made some notes to myself on a printed out copy. I’ve never thought about the concept of arbitrary in any depth. I appreciate this! Glad to point you to this resource. At the Ayn Rand Lexicon online you can get a ton of free material. Rand and Peikoff are very opposed to Christianity, but as a Christian I still find a lot of value in their method. Their method is based on the distinction between the arbitrary and the objective. It follows Aristotle in focusing on the evidence of the senses. The rejection of arbitrary concepts would turn the world back right-side up. You should sell a bumper sticker or a Tshirt. And I admire you for being Berean-like in examining something to sift out the Truth! Why do you care so much about blogging? I would really love to include you. If you have a moment, could you tell me your own special passion that got you blogging? Cody – I see blogging as a platform for ministry. I have my blogs post automatically to Facebook and LinkedIn…so that if some of my contacts are not Christians, maybe something I write will pull them in. I also like the self-imposed deadline. Sunday afternoons is when I write my ‘feedonhim.wordpress.com’ blog and Thursday is my deadline for the following week’s logic blog. Knowing they are coming up each week keeps me reading, praying listening with intent. Thanks for asking.